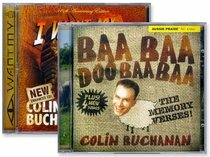 BAA BAA DOO BAA BAA is a collection of favourite memory verse songs from Colin's bestselling 'Aussie Praise for Kids' series. Once described as 'Monty Python meets the Wiggles', I WANT MY MUMMY is a Colin classic, first released in 1993 by ABC Music. About "Baa Baa Doo Baa/I Want My Mummy CD Pack"